Training interpreters is good, and training them well is even better! 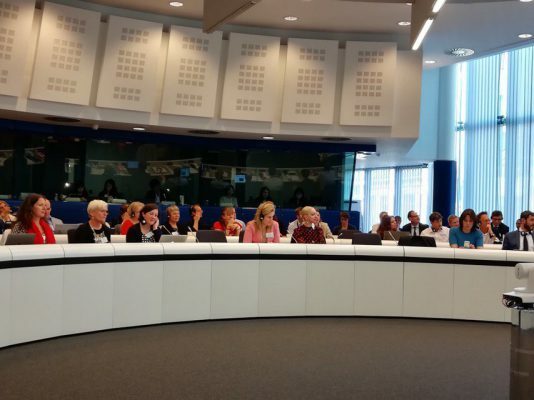 At the regular annual conference titled “Interpretation: Sharing Knowledge & Fostering Communities”, which was held on April 19-20, 2018 in Brussels (Belgium), delegates of the partner universities of the Directorate General for Interpretation of the European Commission (DG SCIC) discussed what exactly determines the training of interpreters nowadays and how to improve the conference interpretation training and make it more efficient. Before the beginning of the conference, Olga Egorova, the Director of the Caspian Higher School of Interpreting and Translation, who was an active participant of the event, met with Florika Fink-Hoojer, the Director General of DG SCIC. During the meeting, the partners discussed further cooperation and implementation of promising interpretation projects in the Caspian region. At the conference, the participants have discussed the most urgent interpretation issues: training interpreters online, modern trends in interpretation, peculiarities of training interpreters in the digital age, changes in the profession of interpreter and many other things. It is important to emphasize that the event serves as an excellent platform for holding a series of workshops with all the key partners from universities and international organizations, discussing cooperation for the next academic year and preparing applications for new grants in order to implement joint projects. Now the School has a lot of new plans and agreements on cooperation, visits and educational assistance of international partners. Follow our news!